For other uses, see De Havilland (disambiguation). 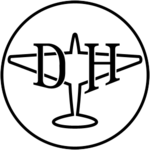 The de Havilland Aircraft Company Limited /dəˈhævɪlənd/ was a British aviation manufacturer established in late 1920 by Geoffrey de Havilland at Stag Lane Aerodrome Edgware on the outskirts of north London. 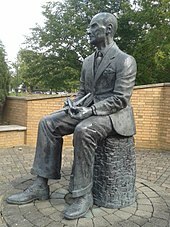 Operations were later moved to Hatfield in Hertfordshire. 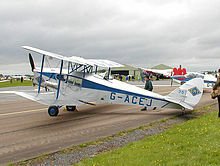 Known for its innovation, de Havilland was responsible for a number of important aircraft, including the Moth biplane which revolutionised general aviation in the 1920s; the 1930s Fox Moth, the first commercial transport able to operate without government subsidy; the wooden World War II Mosquito multi-role aircraft; and the passenger jet service pioneering Comet. In January 1920 Geoffrey de Havilland was working for Airco as technical director and chief designer. BSA bought Airco on 20 January 1920 from George Holt Thomas on the say-so of one BSA director, Percy Martin, having done inadequate due diligence. Within days BSA discovered Airco's true circumstances and shut it down in July 1920. The resulting losses were so great BSA was unable to pay a dividend for the next four years. With Thomas's help, de Havilland took modest premises at the nearby Stag Lane Aerodrome and formed a limited liability company, de Havilland Aircraft Company Limited, incorporated 26 September 1920. The directors were de Havilland, Arthur Edwin Turner, who had come from The War Office, and chief engineer Charles Clement Walker. Nominal capital £50,000. Most of the capital came from Geoffrey de Havilland (£3,000) and George Holt Thomas (£10,000), with various others adding a further £1,000. Banking on an order worth about £2,500 originally intended for Airco de Havilland brought his close-knit team in from Airco: friends Charles Clement Walker (aerodynamics and stressing), Wilfred E. Nixon (company secretary), Francis E. N. St. Barbe (business and sales) and, from Airco's experimental department, Frank T Hearle (works manager). Hugh Burroughes went to the Gloster Aircraft Company. The fledgling enterprise was lucky to be approached the next year by a man wanting a new aeroplane built for him, Alan Samuel Butler. He invested heavily in the business. The first year's turnover was £32,782 and net profit £2,387 and in early 1922 they bought Stag Lane aerodrome for £20,000. They survived until 1925 when de Havilland's own design, the Moth (first flown 22 February 1925) proved to be just what the flying world was waiting for. In 1928 de Havilland Aircraft Company Limited went public. Initially De Havilland concentrated on single and two-seat biplanes, continuing the DH line of aircraft built by Airco but adapting them for airline use, but then they introduced a series of smaller aircraft powered by de Havilland's own Gipsy engines. These included the Gipsy Moth and Tiger Moth. These aircraft set many aviation records, many piloted by de Havilland himself. Amy Johnson flew solo from England to Australia in a Gipsy Moth in 1930. The Moth series of aeroplanes continued with the more refined Hornet Moth, with enclosed accommodation, and the Moth Minor, a low-wing monoplane constructed of wood. One of de Havilland's trademarks was that the name of the aircraft type was painted on using a particularly elegant Roman typeface, all in capital letters. When there was a strike at the plant, the artisans who painted the name on the planes used the same typeface to make the workers' protest signs. In 1937, De Havilland set up a factory in Lostock to produce aircraft propellers for the war effort. The factory is commemorated in the road named De Havilland Way in Horwich. After the Second World War de Havilland continued with advanced designs in both the military and civil fields, but several public disasters doomed the company as an independent entity. The experimental tailless jet-powered de Havilland DH 108 Swallow crashed in the Thames Estuary, killing Geoffrey de Havilland, Jr., son of the company's founder. A large additional aircraft factory was acquired in 1948 at Hawarden Airport at Broughton near Chester, where production supplemented the Hatfield output. The De Havilland Comet was put into service in 1952 as the eagerly-anticipated first commercial jet airliner, twice as fast as previous alternatives and a source of British national pride. The Comet suffered three high-profile crashes in two years. Equally disastrous was the in-flight break-up of the DH 110 prototype during the 1952 Farnborough Airshow, which also killed members of the public. Hawker Siddeley bought De Havilland in 1960 but kept it as a separate company until 1963. In that year it became the de Havilland Division of Hawker Siddeley Aviation and all types in production or development changed their designations from "DH" to "HS" (see Hawker Siddeley Trident and BAe 125). The famous "DH" and the de Havilland name live on, with several hundred Moths of various types and substantial numbers of many of the company's other designs still flying all over the world. 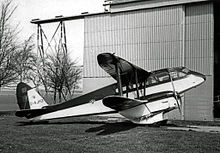 de Havilland Aircraft of Canada Ltd. was formed in 1928 to build Moth aircraft for the training of Canadian airmen and continued after the war to build its own designs suited to the harsh Canadian environment. The DHC-2 to DHC-7 aircraft were all STOL designs. DHC spent a stint as a Canadian Crown Corporation, then as a subsidiary of Boeing, then back as a Crown Corporation. de Havilland (Canada) was eventually incorporated into the Bombardier group of companies and the Dash Eight remains in production with a particular emphasis being placed on its quiet operation in comparison to other aircraft of a similar size. 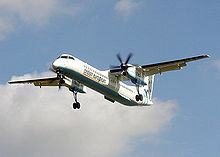 In May 2005, Bombardier sold the rights to the out-of-production aircraft (DHC-1 through DHC-7) to Viking Air Ltd. of Sidney, British Columbia. In November 2018, Viking Air parent Longview Aviation Capital Corp. acquired the Dash 8 programme and the de Havilland brand from Bombardier, in a deal expected to close by the second half of 2019. In January 2019, Longview announced that it would establish a new company in Ontario, reviving the de Havilland Aircraft Co. of Canada name. The first overseas subsidiary was set up in Australia in March 1927 as de Havilland Aircraft Pty. Ltd. The company moved from Melbourne to Sydney during 1930 where it acted as an agency for the parent company, with assembly, repair and spares facilities for the company's popular sporting and airliner types. Aircraft design and full manufacture by de Havilland Australia (DHA) did not take place until the Second World War, when the company began production of the DH 82 Tiger Moth primary trainer at Bankstown, NSW. During the Second World War, DHA designed a small troop-carrying glider to be used if Australia was invaded by Japan. The DH-G1 emerged in mid-1942 and used the DH 84 Dragon forward fuselage, 87 of which were in production at the same factory as navigational trainers. The two built served as prototypes for the definitive DH-G2 produced the following year but the need had passed by this time and only six DH-G2s were built. The company also began to manufacture the Mosquito, with deliveries to the RAAF being first made in 1944. A total of 212 Mosquitos were built at Bankstown between 1943 and 1948. Some of these aircraft continued in RAAF service until 1953. Licensed production of the de Havilland Vampire began in 1948, with the first of 190 built flying in 1949. In 1959 a boat building division known as de Havilland Marine was established at the Bankstown factory. The de Havilland Australia concern is now owned by Boeing Australia and is known as Hawker de Havilland Aerospace. On 6 February 2009, Boeing announced that Hawker de Havilland changes its name to Boeing Aerostructures Australia. To meet the demand for Tiger Moth trainers for the Royal New Zealand Air Force and potentially for RAF training to be conducted in New Zealand, the de Havilland (New Zealand) Company Ltd was established in March 1939, and work commenced on New Zealand's first aircraft factory at Rongotai. After World War II, the company undertook maintenance and refurbishment work until taken over by Hawker Siddeley International NZ Ltd in 1964. The site of the factory is now part of Wellington International Airport. As well as a prolific aircraft builder, de Havilland was also a significant producer of aero engines. This went against usual practice: usually engines are designed and produced by a dedicated company though in the UK the Bristol Aeroplane Company had a substantial engine business and Armstrong Whitworth Aircraft was part of the same business as Armstrong Siddeley The successful "Gipsy" and the later developments such as the Gipsy Major were successful and popular power units, being used in nearly all of de Havilland's light designs and several aircraft from other manufacturers. Gipsy engines were relatively unusual by the 1930s/40s because they were in-line engines, at a time when radial or opposed-action engine layouts were more popular. The de Havilland company was also a competitor to Rolls-Royce and Metrovick in the early years of jet engine development. Employing the services of Frank Halford then buying out his company they produced the de Havilland Goblin and de Havilland Ghost engines for first their jet fighters then the Comet. A company set up in 1935 for the manufacture of Hamilton Standard propellers under licence, and which later produced guided and other missiles such as the Firestreak and Blue Streak. The de Havilland company donated a site to Hertfordshire County Council for educational use: the site was then developed as Hatfield Technical College, which is now the College Lane Campus. de Havilland was purchased by Hawker Siddeley in 1960 and merged into British Aerospace in 1978. The BAE site then closed in 1993, and the University of Hertfordshire purchased part of the site for the de Havilland Campus. Hatfield’s aerospace history is recorded today in the names of local streets, such as Comet Way and Bishops Rise. In September 2003 the former British aerospace site became the de Havilland campus of University of Hertfordshire. ^ Davenport-Hines 2002, p. 216. ^ Flight Magazine, 7 October 1920, p. 1070. ^ a b "The De Havilland Aircraft Company." RAF Museum website. Retrieved: 3 April 2014. ^ a b Flight Magazine, 20 September 1940. p. 254. ^ a b "Obituary: Sir Geoffrey de Havilland, O.M." The Times, Issue 56328, Saturday, 22 May 1965, p. 10. ^ Flight Magazine, 20 September 1940, p. 255. ^ "de Havilland History." Archived 7 October 2007 at the Wayback Machine RAF Museum, Retrieved: 12 August 2007. ^ Landings.com "Australia, Canada, New Zealand, UK & US Civil Aircraft Register databases." landings.com. Retrieved: 12 August 2007. ^ T. A. Heppenheimer (2002). "The Expanding World of the Shuttle". History of the Space Shuttle, Volume Two: Development of the Space Shuttle, 1972–1981. Smithsonian. p. 92. ISBN 978-1-58834-441-0. Retrieved 11 June 2015. ^ "de Havilland Canada." GlobalSecurity.org. Retrieved: 14 April 2015. ^ Warwick, Graham (18 January 2019). "Canada's Longview Plans To Continue Q400 Production As De Havilland". Aviation Week. ^ Ewing 1986, p. 120. ^ White's Air Directory and Who's Who in New Zealand aviation, 1964, p. 7. ^ "de Havilland Rongotai info sought." Wings Over New Zealand Aviation Forum, 7 September 2011. Retrieved: 27 September 2014. ^ After 1935, both part of the Hawker group. ^ "UH 2020 Estates Vision". University of Hertfordshire. Retrieved: 1 October 2014. ^ "Our history." University of Hertfordshire. Retrieved: 30 September 2014. Davenport-Hines, R. P. T. Dudley Docker: The Life and Times of a Trade Warrior. Cambridge, UK: Cambridge University Press, 2002. ISBN 0-521-89400-X. Ewing, Ross. The History of New Zealand Aviation. Portsmouth, New Hampshire: Heinemann, 1986. ISBN 978-0-8686-3409-8. Wikimedia Commons has media related to de Havilland Aircraft Company.